In my distant memories, I think that I have heard the music of Akikaze. In fact, I had a friend who spoke well of him and he even lent me a CD, I believe that it was In High Places, so that I discover the music of the Dutch musician. I didn't hook on it. And, listening to this “Solstice” and to its structures in continual movement, I don't understand why and how I missed that train. This album totally took me by surprise. And, in order to remain calm, I took the time to well listening this last opus of Akikaze of which main lines were presented to the E-Live festival in October 2015 (Gert Emmens played even the percussions on it). Verdict? There are no doubts! I well and truly discovered another small pearl in the vast ocean of EM. For a reason I ignore, I had associated the name of Akikaze, which means autumn wind in Japanese, to a Kitaro style of New Age. Moreover, the German label SynGate has reissued some of his albums on its Bandcamp platform at the end of 2015 in a silence which said it all on the artistic direction of Pepijn Courant, the man behind Akikaze. And then came this “Solstice” on Lambert Ringlage's label, a record company which specializes on the Berlin School style and which is known to produce good artists and mostly some great EM. Twisted effects which break out into a wave of continuous sounds furnish a rather festive introduction to "Jacob's Ladders". A line of sequences, with a harmonious tone which is reminiscent of the very beautiful movements of Eddie Jobson Synclavier on his very poetic and icy Theme of Secrets, made roll its keys which skip in circular movements. The nuances and the notches of the movement give a harmonious nobility which will seduce, under various angles, throughout “Solstice”. The harmonies flow like the grace of a ballet which personifies a dance of swans while in the background sparkles of murmurs remain sieved by the tenacity of a shaded veil. Minimalist and circular, the main movement of "Jacob's Ladders" stretch its charms up until that a line of bass sequences knocks them down with a lively movement and its aura of tension which makes our fingers strum. Layers of voices bewitch this brief change of direction before a 3rd change of skin brings "Jacob's Ladders" towards a more ethereal ambient phase with notes from an acoustic guitar which dream in the calm of sibylline voice layers. Three changes of direction for 7 minutes? We have to live with it because “Solstice” is everything but far from being king of homogeneity. "Halo" begins with a duel between a kind of accordion, a flute and a harp. The harp gets victorious and weaves us a comfortable melody that we would want so eternal. Voices hum behind a new association between the harp and an acoustic six-strings. It's like a small concert of angels in the new Eden which gets lost from the 3rd minute with a spheroidal movement of the sequencer to which get are grafted keyboard keys. The keyboard adds other chords, with more crystalline shadows, and pulls us towards the lands of Berlin School with good effects and a gradation in the rhythm which remains always ambient. The synth spreads beautiful harmonies and good solos whereas some surprising, and very unexpected, percussive effects invite themselves in this sonic painting in movement which tries constantly to fool the hearing with modifications which crop slightly the axis of "Halo" without denying its genre, nor its destination. "Autumn Mist" is a very Vangelis melody in Berlin School ambiences. I found that very seducing. 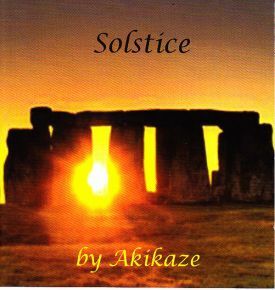 Composed for the E-Live festival, the title-track is the cornerstone of “Solstice”. The first 6 minutes of "Solstice Part 1" are a beautiful moment of romance with an acoustic guitar which condemns its melody to roam in foggy layers which switch shape into rather striking arrangements. A spiral line of sequences injects a circular rhythm which is strongly snatched by very good percussions. The movement becomes then a good phase of progressive electronic rock with a swarm of melodies which survives and which charms in spite of the severity of the percussions' strikes. While my ears get more and more excited, Akikaze unwinds its solos unique to the vintage years which take forms and colors as so creative than in these beautiful years. A superb track which will throw a little of shade on "Solstice Part 2" and its route weaved in the continuity, here the first 6 minutes are forged in melancholy with a delicate flute and its fragile bucolic chant. Lively sequences flicker and congeal a still rhythmic after 6 minutes, forging a more electronic rhythm, in spite of the percussions, which seduces just as much with the very beautiful synth, and the way he is using it, of Akikaze. Because of its very changeable character, and its numerous arrangements drawn in the 60 other minutes of “Solstice”, "Northern Light" requested me more than one listening to find satisfaction between my ears. With hesitating pulsations in an organic sound envelope and carousels of sequences glittering on the spot, the introduction is tinted with an approach sewn by mystery. A first mobile line of sequences emerges after 120 seconds. The rhythm becomes fluid with a running which oscillates cheerfully in layers of voices in the shape of riffs. Another movement of bass sequences runs like the one in "Jacob's Ladders" while a 3rd one cements a more harmonious approach. These 3 layers alternate the phases of steady rhythm, of ambient phases and of harmonious ones in an ascending movement which coats itself of a soft sibylline choir and of nightmarish organ layers. A first bridge of ambiences appears around the 7th minute, bringing "Northern Light" on a path sculptured by sequences which go tiptoe. Some very nice orchestrations throw a dose of passion on the harmonies become hoarser and on sequences become less uncertain. Slowly, the universe of "Northern Light" falls over again but this time towards a more harmonious race. The synth displays its more discreet charms whereas always glitters this swarm of sequences which goes and comes discreetly. The layers of organ are more chthonian and the rhythm which follows is more ambient, leading the fates of "Northern Light" being consumed by a lullaby as much morphic as so very oniric. Dans mes lointains souvenirs, il me semble avoir déjà entendu la musique d'Akikaze. En fait, j'avais un ami qui en parlait en bien et il m'avait même prêté un CD, je crois que c'était In High Places, afin que je découvre la musique du musicien Hollandais. Je n'avais pas vraiment accroché. Et, à l'écoute de ce “Solstice” et de ses structures en continuel mouvement, je ne comprends pas comment ai-je pu avoir louper un tel artiste. Cet album m'a totalement pris par surprise. Et, question de ne pas m'emballer trop vite, j'ai pris le temps de bien écouter ce dernier opus d'Akikaze dont les grandes lignes furent présentées au festival E-Live en Octobre 2015 (Gert Emmens y jouait même les percussions). Verdict? Il n'y a pas de doutes! J'ai bel et bien découvert une autre petite perle dans le vaste océan de la MÉ. Pour une raison que j'ignore, j'avais associé le nom d'Akikaze, qui signifie vent d'automne en japonais, à du New Age à la Kitaro. Le label allemand SynGate avait d'ailleurs ressorti quelques-uns de ses albums sur sa plateforme Bandcamp à la fin de 2015 dans un silence qui laissait planer un doute sur la direction artistique de Pepijn Courant, l'homme derrière Akikaze. Et puis vint ce “Solstice” sur le label de Lambert Ringlage, une maison de disque qui se spécialise sur le style Berlin School et qui a l'habitude de signer de bons artistes. Des effets torsadés qui déferlent en une vague de sons continus garnissent une introduction plutôt festive de "Jacob's Ladders". Une ligne de séquences, avec une tonalité harmonique qui n'est pas sans rappeler les très beaux mouvements du Synclavier d'Eddie Jobson dans le très poétique et glacial Theme of Secrets, fait rouler ses ions qui sautillent en mouvements circulaires. Les nuances et les échancrures du mouvement rend une noblesse harmonique qui séduira, sous différents angles, tout au long de “Solstice”. Les harmonies coulent comme la grâce d'un ballet qui personnifie une danse des cygnes alors qu'en arrière-plan des éclats de murmures restent tamisés par la ténacité d'un voile ombragé. Minimaliste et circulaire, le principal mouvement de "Jacob's Ladders" étire ses charmes jusqu’à ce qu'une ligne de basse séquences les bouscule avec un mouvement vif et son aura de tension qui fait pianoter nos doigts. Des nappes de voix ensorcèlent ce bref changement de direction avant qu'un 3ième changement de peau amène "Jacob's Ladders" vers une phase d'ambiances plus éthérée avec des accords de guitare acoustique qui rêvent dans des nappes sibyllines. Trois changements de direction pour 7 minutes? Faut s'y faire, car “Solstice” se tient loin de tout ce qui concerne l'homogénéité. "Halo" débute avec un duel entre accordéon, flûte et harpe. La harpe sort vainqueur et nous tisse une somptueuse mélodie que l'on voudrait tant éternel. Des voix chantonnent derrière une nouvelle association entre harpe et six-cordes acoustique. C'est comme un petit concert d'anges dans le nouvel Éden qui s'égare dès la 3ième minute avec un mouvement sphéroïdal du séquenceur où se greffent des accords de clavier. Un clavier qui ajoute d'autres accords, avec des ombres plus cristallines, et nous attire dans les terres de la Berlin School avec de bons effets et une gradation dans le rythme qui reste toujours ambiant. Le synthé étend de belles harmonies et de bons solos tandis que d'étonnants, et très inattendus, effets percussifs s'invitent dans cette toile en mouvement qui cherche constamment à déjouer l'ouïe avec des modifications qui détourent légèrement l'axe de "Halo" sans pour autant renier son genre, ni sa destination. "Autumn Mist" est une mélodie très Vangelis dans des ambiances Berliner. J'ai trouvé ça très séduisant. Composé pour le festival E-Live, la pièce-titre est la pierre d'assise de “Solstice”. Les 6 premières minutes de "Solstice Part 1" sont un beau moment de romance avec une guitare acoustique qui condamne sa mélodie à errer dans des nappes brumeuses qui se transforment en arrangements assez saisissants. Une ligne de séquences spiralée injecte un rythme circulaire qui est fortement happé par de très bonnes percussions. Le mouvement devient alors une bonne phase de rock électronique progressif avec un essaim de mélodies qui survit et qui charme malgré la sévérité des frappes de percussions. Alors que mes oreilles deviennent de plus en plus folles de plaisir, Akikaze déroule ses solos uniques aux années vintage qui prennent des formes et des couleurs aussi créatives que dans ces belles années. Un superbe morceau qui jettera un peu d'ombre sur "Solstice Part 2" et de son parcours tissé dans la continuité, ici les 6 premières minutes sont forgées dans la mélancolie avec une délicate flûte et son fragile chant bucolique. Des séquences vives papillonnent et figent une rythmique stationnaire après les 6 minutes, forgeant un rythme plus électronique, malgré les percussions, qui séduit tout autant avec le très beau synthé, et la façon dont il s'en sert, d'Akikaze. À cause de son caractère très changeant, et ses nombreux arrangements puisés dans les 60 autres minutes de “Solstice”, "Northern Light" m'a demandé plus d'une écoute afin de trouver satisfaction entre mes oreilles. Avec des pulsations hésitantes dans une enveloppe sonore organique et des carrousels de séquences miroitant sur place, l'introduction est teintée d'une approche cousue de mystère. Une première ligne de séquences mobile émerge après 120 secondes. Le rythme devient fluide avec une course qui oscille allègrement dans des nappes de voix en forme de riffs. Un autre mouvement de séquences basses court comme dans celui de "Jacob's Ladders" alors qu'une 3ième cimente une approche plus harmonique. Ces 3 couches alternent les phases de rythme soutenus, ambiants et harmoniques dans un mouvement ascendant qui se nappe d'une douce chorale sibylline et de nappes d'orgue cauchemardesques. Un premier pont d'ambiances surgit vers les 7 minutes, amenant "Northern Light" sur un sentier sculpté par des séquences qui marchent à pas-de-loup. De belles orchestrations jettent une dose de passion sur les harmonies devenus plus rauques des séquences devenues moins incertaines. Doucement, l'univers de "Northern Light" bascule à nouveau mais cette fois-ci vers une course plus harmonique. Le synthé déploie ses charmes plus discrets tandis que miroitent toujours cet essaim de séquences qui va et vient en toute discrétion. Les nappes d'orgue sont plus chtoniennes et le rythme qui suit plus ambiant, conduisant les destinées de "Northern Light" consumée par une berceuse aussi morphique que très onirique.